This tasty rice was one of the first rice dishes I learned to make. This was also one of the dishes that I craved during the last few weeks of my pregnancy. The few ingredients that go into the making of this rice are enough to make it exotic. The basic flavours of tomatoes and coconut dominate and the spices used in the making of this rice, cloves, cinnamon and chillies impart subtle highlights. Many years ago, our neighbours, having made a trip to Dehradun, where nature produces the best Basmati rice ever, gave us a few kilos of first class excellent quality basmati rice from there. Even premium factory packaged basmati rice available in the markets and stores somehow fails to match the top notch quality of rice sold from certain vendors in Dehradun. One afternoon, I returned from college and made this rice, with my grandmother’s instructions like if you over handle the delicate grains of the rice, the fragile rice grains will break, etc hovering in the background. Everyone at home enjoyed the preparation for lunch. My friend who was there with me when preparing this rice went home and replicated the same recipe, which also met with success and was enjoyed by her family. I have still not ventured into the kitchen post the birth of my son and am being fed and nurtured by my mother. The baby is getting used to his new environment, trying to know his new family just like how we are getting to know him and enjoying the new discoveries about him as a person and as an individual. 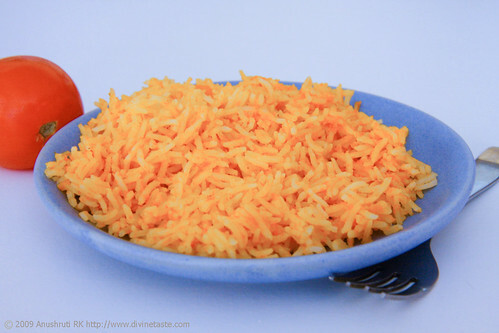 This rice is a family favorite and I love the simple yet exquisite flavours in this dish. It is great to serve in a party or to eat as a part of a home cooked meal. 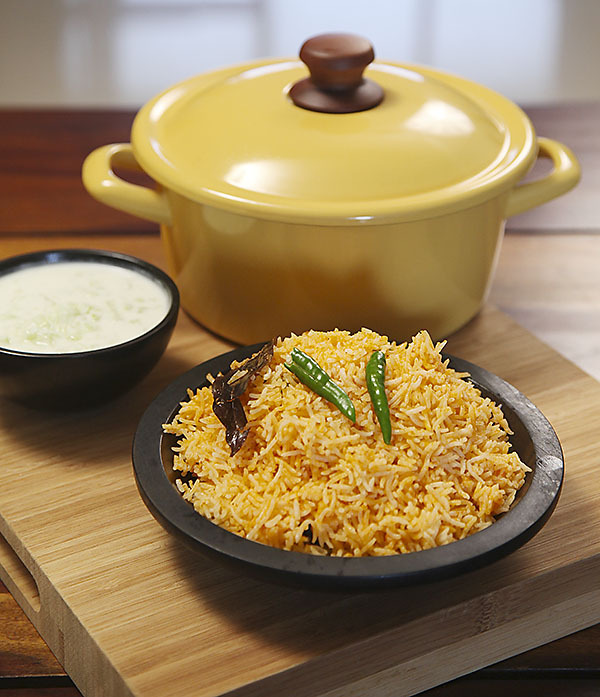 Serve it with a raita and you are all set! I used my beautiful Fujihoro casserole to make this dish. You can cook and serve in this casserole dish. Check out Fujihoro's beautiful collection of cookware here. This rice tastes great with plain yogurt/curd or cucumber raita. Wash and rinse the rice in a colander in a running stream of water for about a minute or until the water runs clear and soak the rice for 15 minutes to ½ hr, with enough water to cover the rice. Remove the eye of the tomato and make cross slits on the other end of the tomatoes. This makes it easier to peel the skin. In a medium sized saucepan, bring water to a boil and the tomatoes. Cook until their skin starts to peel. Cool the tomatoes, remove the skin and grind to a puree in a blender or food processor. Strain the puree to remove the seeds. Prepare fresh coconut milk or use prepared ones off the shelves. In a medium sized pot with heavy fitting lid, heat the oil over a medium flame. Add the cloves, cinnamon, bay leaf and green chillies, stir and cook for 2 to 3 minutes until the spices release their flavours into the oil. Lower the flame, strain the rice and add into the spiced oil. Stir briefly for about a couple of minutes, taking care not to break the rice grains. Pour in the boiled tomato puree and coconut milk, add the salt, cover the lid and cook on the lowest flame for 15 to 20 minutes. When the rice grains are cooked, remove the lid, allow the steam to escape for about 2 to 3 minutes, fluff with a fork and serve hot. Alternatively, make the rice in a rice cooker. After adding the liquids into the sautéed rice, transfer all the contents into the rice cooker and cook till done. oh my god! i miss that angel face. which neighbour r u referring to… guess this was when i was away from home? Nice stuff. I have had Tomato Rice & Coconut Rice separately but never both in the same dish. Definitely worth a try. Simi – how about it – I make this for our next Sunday snack? I remember this one. You had made this during our college days. Wow!I am giving this recipe to my mother rightaway. This sounds amazingly good! I can't wait to try it. I dont mind Mr. Chef 🙂 But why snack, this would be a meal baba! Dear Anu, gr8 to see you back on the roll with mouth watering recipes. Hey along with the baby's arrival(kisses to him) and congrats on your post being added on to Kurma's blog! What an honour:) …. wanted to eat the rice rightaway as usual but i need to go and buy coconut milk 🙁 grrr!! Anu, just wanted to share with you that i prepared this rice for a small get together at home and it was an instant hit 🙂 Thanks! Melinda: You need not thin the coconut milk with water as the uncooked rice to liquid ratio needs to be right to get the correct consistency. Did you use coconut milk or coconut cream? There is no problem in using store bought coconut milk, but coconut cream wont work here. If you measure correctly, then continue to cook the rice on low heat until all the liquid is absorbed to get the perfect grain of rice. This recipe sounded great so I decided to try making it in my rice maker to unfortunate results….the rice did not cook all the way through and is still crunchy. I have made tons of different rice dishes in the same cooker and they have all turned out fine so I'm not sure what I could have done wrong. chez: I'm sorry your rice was not cooked well. From what you have described it seems like you have used very thick tomato puree and thick coconut milk. When there is insufficient liquid the rice ends up that way! 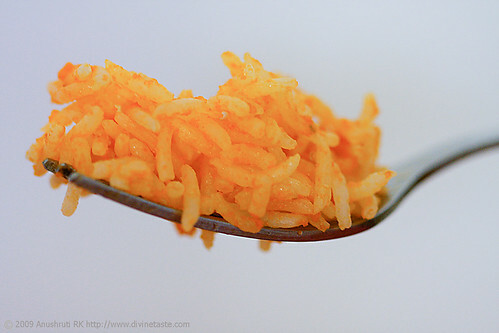 I just wanted to let you know that this rice has become one of my and amith's favorite and we absolutely relish it! It was no surprise that sona who is an extremely fussy eater also is in love with this rice! She can't seem to have enough of it and can't wait between spoons 🙂 thankyou so much for this wonderful recipe! Soumya: How nice to hear that! Very good recipe. Fewer ingredients…easy to cook yet so tasty. Thanks for the recipe. Supreeta- This is one of my favourite recipes. Glad you like it.